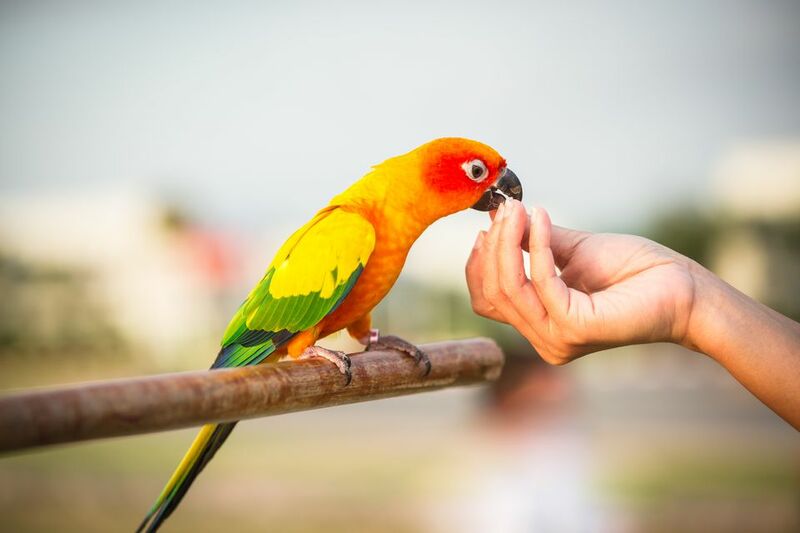 Attempting to keep a wild bird as a pet is a horrible idea in the vast majority of cases, and depending on where you live, it could also be illegal. In the United States, it is against the law to keep any sort of wild native bird captive, and anyone who is caught doing so could be charged with a felony. In fact, the law even extends to things like feathers and eggshells—meaning that to possess any feather of a wild native bird, an egg, an eggshell, or anything of the sort is illegal as well. This is only one reason why it's generally best to steer clear of the idea of taming a wild bird and keeping it as a pet. Another problem with keeping "wild birds" as pets is that it would be rather unethical to do so. Taking a wild animal out of its habitat and placing it in a cage isn't a very humane thing to do in the eyes of most people, and the vast majority of parrots and other species that are commonly kept as pets have been bred in captivity. These birds wear a metal band around one of their legs to show that they have not been taken from the wild. It would be likely to be extremely difficult, if not impossible, to find an avian vet that would be willing to treat a wild bird if he or she were to get sick—especially if it was a protected species. If you find a wild baby bird that you feel is orphaned and needs help, leave it be and notify your local wildlife agency of the situation. That way, you can be assured that the bird will be taken care of and that you are handling the situation legally. There are a few instances where you might be legally permitted to keep an orphaned baby bird that you find, but that would only be if it were a European Starling, a Pigeon, or a Sparrow, the three species that are not protected by law in the United States. What About the Sport of Falconry? In general, attempting to keep any bird of prey is highly illegal and a bad idea—birds of prey are notoriously hard to care for. However, the sport of Falconry is one that many individuals engage in and enjoy. The Falcons used in the sport are bred in captivity and go through rigorous training. To become involved in Falconry, you must have an extreme interest in the sport and a commitment to doing the best you can to care for your birds. While anyone can become a Falconer, it isn't an easy process. You must first find a seasoned and established Falconer that will sponsor you and help you get your first tastes of the sport. From there, you must secure several permits to be able to keep a bird, and these are on both the Federal and State level in the United States. It is a big investment, a long process, and one that not many people are able to see through to the end. However, if you are interested in learning more about Falconry, you should start by contacting the North American Falconers Association.